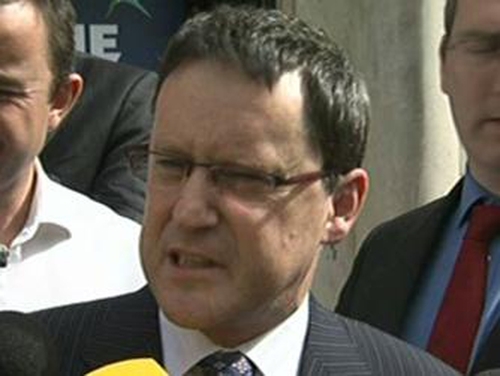 Former RTÉ Economics Editor George Lee is to seek the Fine Gael nomination for the Dublin South bye-election. The RTÉ journalist is expected to contest the 5 June poll caused by the death of Séamus Brennan. For weeks Fine Gael has signalled it would unveil a so-called celebrity candidate to contest Dublin South and George Lee's name has been frequently mentioned in press speculation. He was appointed RTÉ's Economics Editor in 1996 and has had an increasingly high profile as the economy declined. Speaking on RTÉ's News at One, Mr Lee accused the Government of catastrophic economic management time and said it was time for people like him to get off the fence and see if they could make a difference. He said he was paying a big price in leaving RTÉ, but that it was not one he was paying to sit on the backbenches. He said he wanted to ensure the country got better Government than it was getting at present. However, Mr Lee denied there had been any deal with Fine Gael in respect of any position he might hold if elected. He also rejected suggestions that he had compromised his impartiality by continuing to appear as an independent economic analyst while he was deciding whether to seek the Fine Gael nomination. Fine Gael was due to formally name him today as its candidate ahead of the nomination convention tomorrow. There are already two sitting Fine Gael TDs, Alan Shatter and Olivia Mitchell, in a constituency that has traditionally been volatile and hotly contested. Communications Minister Eamon Ryan holds a seat there for the Green party. Mr Lee told colleagues this morning the decision had been a difficult one. His entry into the race will put pressure on Labour's Alex White, while Fianna Fáil has yet to formally choose its ticket from a field that includes Shay Brennan, son of the late Séamus Brennan, and Senator Maria Corrigan. Meanwhile, Senator Ivana Bacik has been confirmed as the Labour Party candidate for the Dublin Central bye-election.